The New Zealand Mint is a privately-owned producer of coins and bars for a handful of countries, and for investors and collectors. Based in Auckland, it is one of the most popular mints in the world for collectible coins. The New Zealand Mint does not produce coins or paper money for its own country. That’s done by others, most notably the British Royal Mint. It does, however, produce bullion coins and collectibles, with many of these carrying the name of Pacific nations such as the Cook Islands, Fiji, Tuvalu and Niue. 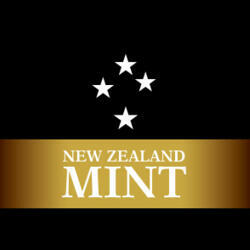 As a private company, the New Zealand Mint thinks and operates differently than many other mints. Examples of this are their coin series based on popular culture, such as those that depict images from Star Wars and Disney. It also uses most of its time and resources to create coins and bars for the collectibles industry, many of which are also classified as legal tender. The New Zealand Mint has flourished over the last couple of decades, even in the face of the financial downturn. As global economies suffered and people began to worry about their financial security, the New Zealand Mint prospered and grew exponentially. It improved its product lines and started acquiring major licenses and trademarks. The New Zealand Mint has acquired several licenses to create coin series based on pop culture. Some of the most popular include their Disney and Star Wars collections, as well as their collaboration with US toy giant Hasbro on Monopoly. These are available in silver and gold and in many sizes, although they usually focus on half-ounce and 1 ounce coins (which are what most collectors and investors seem to prefer). Just like the Perth Mint, the New Zealand Mint has a Lunar Series, but Perth’s product is much more extensive and seems to enjoy greater popularity. Some of the most beautiful and desired coins created by the New Zealand Mint are branded with the name of the Pacific nation of Niue. These include the Disney series, which includes the Mickey and Friends series and the Disney Princess series. These feature immaculately and uniquely presented 1 ounce coins. All of them have colored, detailed depictions. The Disney Princess coins come in a small book with information and an image of the princess. The Mickey and Friends coins come in a Perspex case, which offers protection as well as great presentation value. These coins carry a premium. At the time of their launch, they sold for about $100 a piece. However, considering the demand, the presentation, the popularity of Disney and the low mintage (10,000 each), it is highly likely this will increase over time. The coins were created with help from the Perth Mint, and the result turned out to be quite amazing. Just as beautiful and unique is the Charles Dickens “coin”, also produced with the Niue mark. This is a rectangle coin that is laid out like a passport or book. It has a seam down the middle with the words “Charles Dickens”. On the right there is a full-color image of the famous English author; on the left is an image of Queen Elizabeth II, as well as the date it was minted (2015) and the face value ($2). The coin comes in a beautifully designed hard-back book, looking like one of the old-time creations from the master himself. It’s a very unique coin, and the New Zealand Mint did something similar with William Shakespeare. Both have a mintage of 10,000 and they are best bought as silver, 1 ounce pieces.